What's the Difference Between Mayonnaise and Aioli? Aioli is one of the hottest condiments in restaurants across the country. It's served with steamed vegetables, poached fish, delicately fried seafood, or in lieu of ketchup for french fries. But is it just a fancy name for mayonnaise? With its creamy texture and white color, aioli does look just like mayo, and, unfortunately, in many places, the two have become synonymous. Although many restaurants tout aioli on menus when they're really using flavored mayonnaise, there is a legitimate difference between the two spreads. Once you take a closer look at the composition of each condiment, the differences and similarities become clear. Mayonnaise is an emulsion created with egg yolk and oil. When the oil is slowly added to the egg yolk while beating the mixture vigorously, the oil breaks up into tiny droplets that then get suspended within the egg yolk. Thousands of tiny droplets of oil create the creamy, opaque whitish color of mayonnaise in contrast to the clear appearance of oil. Lecithin in the egg yolk acts to keep the droplets suspended and prevent the oil from separating out and regrouping like it normally would. Mayonnaise typically uses a neutral, flavorless oil, like canola. It sometimes has an acidic ingredient, such as lemon juice or vinegar to provide tartness and a slight contrast to the smooth oil. Salt, white pepper, and dry mustard powder are also common ingredients in mayonnaise, although just about anything can be added. 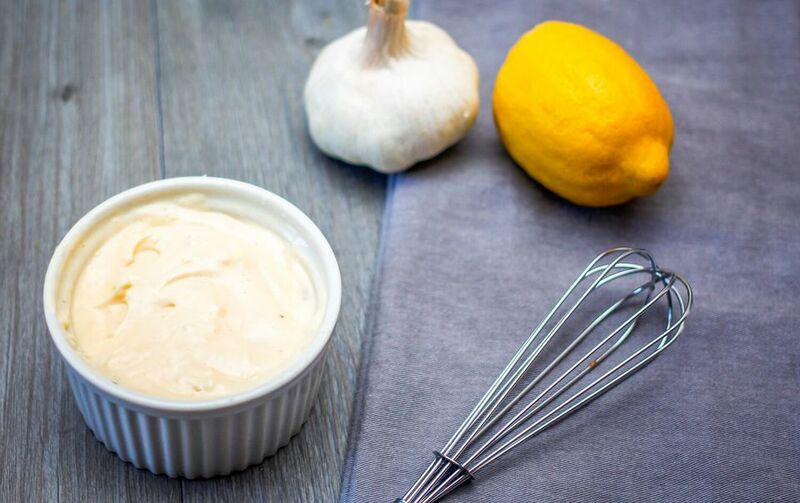 A thick garlic sauce, aioli is a traditional condiment in the cuisine of Provence, France, and Catalonia, Spain. True aioli is an emulsion created with just garlic and extra virgin olive oil. This makes the common menu item, “garlic aioli,” rather redundant. In fact, the name aioli translates to "garlic oil." Aioli gets its creamy consistency and pale color from emulsifying the two ingredients, with a bit of coarse salt. Because garlic does not have strong emulsifying properties like egg yolk, it takes a great deal of elbow grease to emulsify olive oil into the garlic. This is especially true if you were to use the traditional preparation method with a mortar and pestle. The cook needs to mash the garlic cloves into a paste while slowly adding lots and lots of olive oil. Stirring and mashing are required the entire time until the mixture is pale and smooth. Thus, sometimes other ingredients are added to help the garlic and olive oil emulsify faster. Bread is a common emulsifier, as is egg yolk, which is where the similarities between aioli and mayonnaise begin to appear. Even when egg yolk is included in aioli, it still differs greatly from mayonnaise. That's because of the strong garlic flavor and the use of extra virgin olive oil, which has a distinct flavor of its own. Each of these two sauces has many variations. This causes even more confusion for those with little culinary knowledge. For instance, you can have garlic-flavored mayonnaise that differs from aioli because it is made with a neutral oil. You might also find an olive oil mayonnaise that isn't quite aioli because it doesn't contain garlic. One thing is for sure, though, when you see aioli on a menu, you're going to get a creamy oil emulsion spread. Whether it's a true aioli or simply a mayonnaise-dressed to impress is the chef's secret.